Gould Construction offers several professional services including trucking, crushing and screening, and specialized backfill..
Gould Construction operates a full fleet of trucks including 16 tandem dumps (10 cy), 5 end dumps/belly dumps (16 cy), 4 water trucks and other miscellaneous trucking equipment used for mobilization of equipment and maintenance. By controlling trucking operations on projects, many typical scheduling problems are avoided. 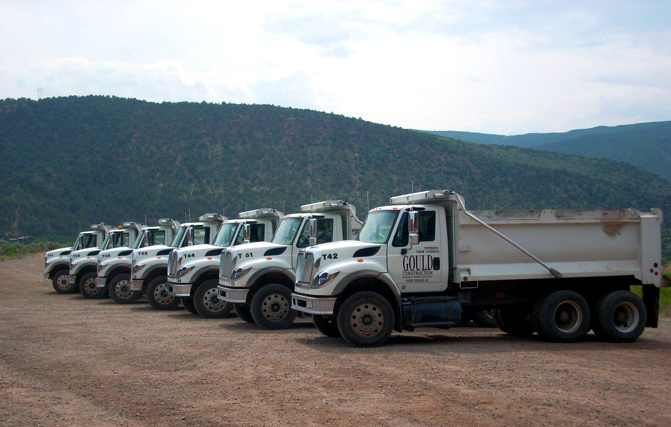 The trucking department has tackled many large hauling projects throughout the valley. 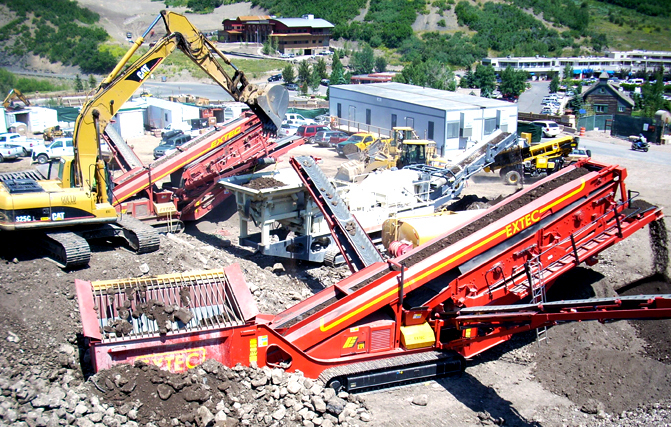 At the Aspen Highlands base village over 200,000 cubic yards were hauled offsite to accommodate the new development. The Two Rivers Village project in Dotsero required moving 710,000 cubic yards from an off site borrow area. Crushing and screening of on-site materials allows Gould Construction to significantly reduce construction costs and trucking operations for a wide variety of processed materials including spec structural fill and topsoil. Industry standards now require that structural backfill and fill materials all meet a 4” minus specification. Our crushing equipment has the capabilities of processing material with rock up to 2 feet in diameter to meet this specification. As a part of the Snowmass Base Village project, Gould Construction processed over 40,000 cubic yards of on site materials for structural backfill eliminating the need to export this material off site. This equipment also allows us to recycle all concrete and masonry materials on projects that require a significant amount of demolition of existing structures. For example on a recent demolition job in Glenwood Springs we were able to reduce the volume of material going to the landfill by 30% by crushing all foundations and masonry components of the buildings. The material was stockpiled on site to be used for future construction. 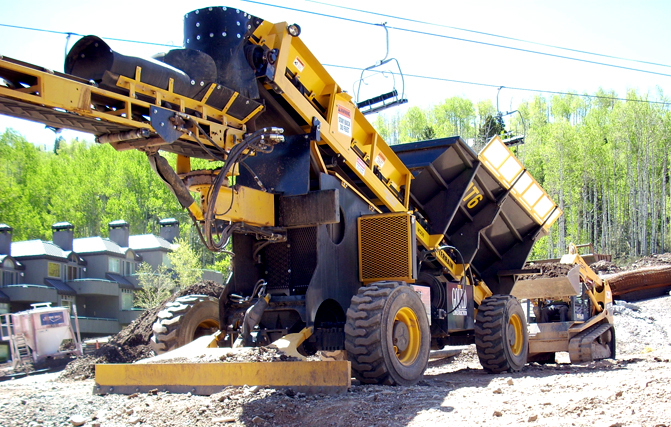 Our screening equipment allows us to process a wide variety of materials to landscape grade topsoil. Typically in Colorado most topsoil’s can have a significant amount of rock that will not meet landscape specifications. By screening this topsoil, the need to import expensive soils is eliminated and costs reduced. The processing of onsite materials and the reduction of trucking to import and/or export materials for a project can often significantly contribute to LEED certifications for owners. 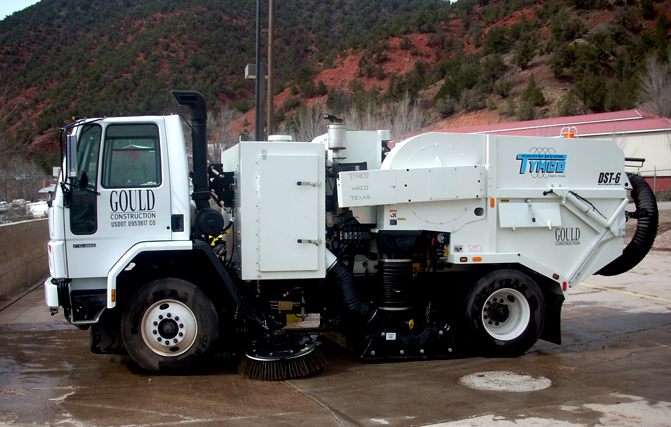 Gould Construction’s latest addition includes a machine called the AT 6. This machine is an off road conveyer system which can throw 5 inch minus material up to 160 feet. Applications include backfilling trenches or buildings in nearly impossible locations, backfilling pond liners, placing stone for slab prep, and many more. The AT 6 is accurate enough to reduce labor and machine time where grade is important. If you have a tight area or limited access where you need material, then this machine is what you need. Gould Construction is committed to having a minimal impact to the public and to the environment. Part of this commitment is fulfilled through our extensive fleet of street cleaning equipment. We have street sweepers that attach to our IT Loaders and Skid steers, as well as a broom car and a commercial sweeper/vac truck. We are capable of parking lot, curb and gutter, sidewalk, and bike path sweeping activities. We also clean and maintain the cleanliness of the streets adjacent to our jobsites and other common areas within our work sites.